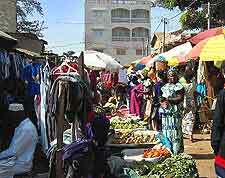 In The Gambia there are enough shopping opportunities to satisfy even the most ardent shopaholic. From fruit stalls and craft markets to small shops and supermarkets, the choice is plentiful. Most shopkeepers and market traders are happy to do some bargaining if you fancy having a haggle. 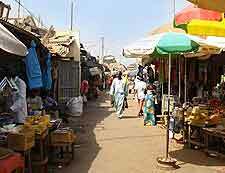 Shops in The Gambia generally open on weekdays from 09:30 to 12:00, reopening in the afternoon from 14:30 to 18:00. At the weekend, shops are mostly only open on Saturday morning, from 09:00 to 12:00. Supermarkets may often stay open longer. It is possible to pick up most items you need in Banjul city. 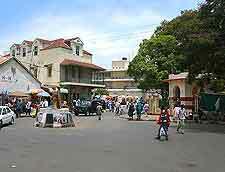 Here, there is a good selection of shops and supermarkets, as well as craft markets. Albert Market and the roads around Liberation Avenue are a particularly good place to find locally handcrafted products, as well as fabrics, shoes, clothes, hardware and groceries. The atmosphere at the market can best be described as lively, with visitors getting plenty of local attention when they first arrive. Other markets can be found in the coastal town of Bakau, on the far westerly side of The Gambia, where you can buy fresh fruit and vegetables, as well as craft items. Serrekunda market is also worth a look, particularly if you are shopping for some new clothes, shoes or something new to wear on the beach. In fact, fruit stalls and craft stalls can be found in most tourist areas, particularly outside some of the larger hotels. A number of large shops and supermarkets line Kairaba Avenue, formerly known as Pipeline Road, which lies between Fajara and Serekunda. The Karaiba Shopping Centre and Supermarket is the largest store in The Gambia, selling everything from fruit and vegetables to shoes and sports kit. Electronic goods, as well as a range of household products, can be purchased at Sony's Supermarket on Kairaba Avenue. The largest supermarket chain in The Gambia is St. Mary's Food and Wine. This company has a total of five branches in the Kombo area.